What does it look like to analyze social science through a mathematician’s lens? 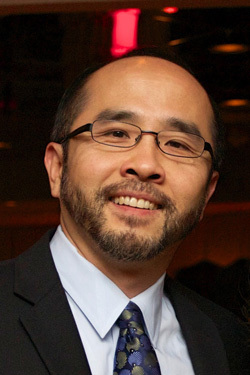 Francis Edward Su, the president of the Mathematics Association of America, will use mathematical modeling to give insights into electoral politics as he delivers a free talk for the public on Thursday, Feb. 2. The event begins at 7:30 p.m. in Science B Building, Room 135. “Mathematics actually has something interesting to say about social sciences, and social sciences can motivate new mathematical questions,” Su said during an address to the MAA last year. Currently the Benediktsson-Karwa Professor of Mathematics at Harvey Mudd College, Su is a Harvard-educated math expert renowned for his teaching and ability to make complicated mathematical concepts accessible to the public. Su’s lecture, “Voting in Agreeable Societies,” will analyze a form of voting known as approval voting. Approval voting is a single-winner voting method, where each voter may “approve” any number of candidates. The winner is the most approved candidate. Most elections use plurality voting to determine the winner, but Su suggests approval voting could let voters make broader selections. “The idea is you can vote for as many candidates as you want, and the person with the most votes wins. If you have eight people in an election, you vote for 4 you like,” says Su. Su’s talk will demonstrate how the geometry of data sets and their intersections can be used to model people’s preferences and understand approval voting operates in “agreeable” societies, where among every three individuals, a pair can agree on one candidate. He will discuss questions such as: When does a majority exist? How does the geometry of the political spectrum influence the outcome? What does mathematics have to say about how people behave? The talk will be accessible to a general audience and assume no previous knowledge of the subject. This is the 69th Harry S. Kieval Lecture. The lecture series is named after HSU Mathematics Emeritus Professor Harry S. Kieval, who taught at HSU from 1966 to 1979. Professor Kieval funded the lecture series to bring prominent mathematicians to the HSU campus two times per year to discuss popular and/or broad aspects of mathematics attractive to undergraduates and the public. The lecture takes place in the Science B building, Room 135, on the HSU campus, starting at 7:30 p.m. Thursday, February 2, 2017. This event is free to the public. When: Thursday, February 2, 2017, 7:30 p.m.